Av Rhuddem Gwelin. Pocket. Del 1-4 i serien The Merlin Chronicles. The Nature of Things (part 1): The legend begins in 6th century Britain. The Wrathful Traveller (part 2): Merlin lives again, 11th century Crusades. Protecting Cheesyfee (part 4): Merlin in our own time, London. 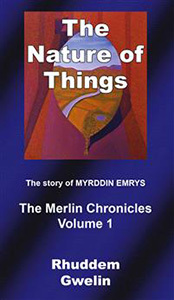 Historically documented, legend, fantasy – Merlin, Morgana, Arthur, Guinevere live. And live again. And again. In The Merlin Chronicles.